The cliché is that money doesn’t buy happiness, but it certainly can cause stress. More than half of Americans say that financial stress had a negative impact on their life in 2018. 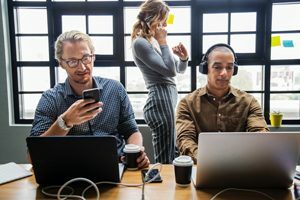 This is even more pronounced in younger generations, with 72 percent of Millennials and 61 percent of Gen Xers indicating that financial stress has negatively impacted either their personal health or their performance at work1. Some of this stress could be a result of debt, since more than three-quarters of Americans have some kind of debt, and two-thirds say their debt is a problem. But beyond just debt, nearly a third of individuals (29 percent) describe their financial situation overall as “in trouble” or “barely getting by,” and less than half do not have an emergency fund2. Disability insurance provides paycheck protection, so if someone is unable to work due to an illness or injury, they won’t lose their source of income. Accident insurance helps pay for expenses that aren’t covered by health insurance, such as high deductibles. Critical illness insurance provides funds to cover day-to-day expenses while someone is recovering from an illness – such as mortgage payments, childcare, food and more. Having these coverages in place can help people save confidently, without the worry of compromising their savings if something unexpected comes their way. And unexpected issues happen – 29 percent of adults say they or someone in their household had an unexpected health or medical expense in 2018, while 17 percent of adults say they or someone in their household had an accident last year. People who have experienced either an unexpected health or medical expense, or had an accident are one and a half times more likely to say that financial stress had a negative impact on their health and/or work performance4. This presents a tremendous opportunity for employers to help their employees understand how the benefits they offer, like accident, critical illness and disability insurance, can provide financial peace of mind, and help reduce their financial stress. The good news is, employers understand the value of these important products. After medical insurance, employers believe it is most important to offer short-term disability insurance, followed closely by long-term disability insurance. They see the value of other employee benefits as well, as 89 percent of employers say it is important to offer dental insurance, life insurance (88 percent), accident insurance (82 percent) and critical illness insurance (80 percent)5. At Lincoln Financial, we took a deeper dive into how employers and individuals see disability insurance, to better understand their perspectives on the importance and value of this benefit. Individuals we surveyed indicated that having disability insurance provides them with some comfort in knowing they will be covered in case something were to happen to them. We also found that those who have disability insurance are more likely to own other types of insurance, like accident and life insurance, than those who do not. And, 97 percent of those who own disability insurance consider it to be important, citing the need for security if they were to be unable to provide for their families7.